Myprepaidcenter.com is the official website used for managing Prepaid Visa Gift Cards issued by BlackHawk Networks. Use the website to check your Discover, MasterCard or Visa card balance, view past purchases and statements, card registration and activation, or to change your personal details. Blackhawk Discover gift cards and prepaid cards are issued by MetaBank®, Member FDIC. In the U.S.A, Visa Prepaid Cards and Mastercard Prepaid Cards are issued by MetaBank, Member FDIC. Visa Prepaid Cards and Mastercard Prepaid Cards are issued by Peoples Trust Company in Canada. Do I need to active my Myprepaidcenter Visa/Mastercard? Yes, when you first receive your prepaid card, you will need to activate the card before you can use it. How do I activate my Myprepaidcenter Card? To register/cativate your card, simply go to Myprepaidcenter.com. On the right hand site of the page, locate the Card Number field and enter your 16-digit card number. Enter the expiration date, and then the 3-digit security code from the back of your card in the appropiate boxes. Click/Check the “Im not a Robot” box. Fill out all fields to activate your card and log in. 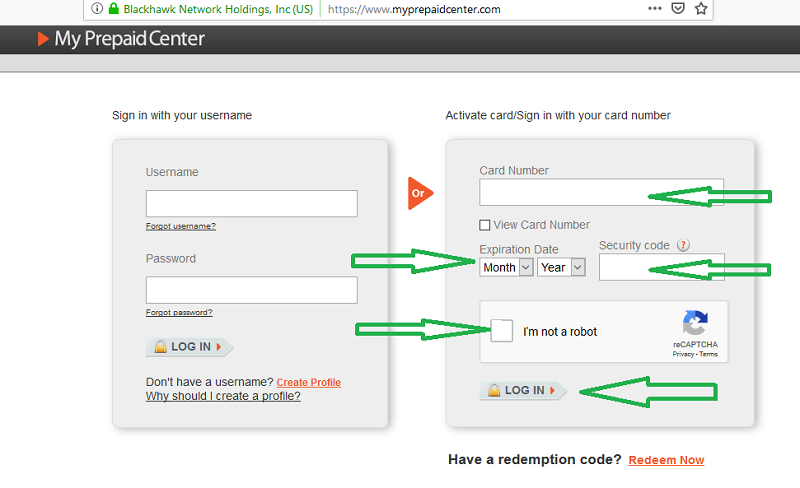 How do I log in to my Myprepaidcenter Prepaid Visa, Discover or Mastercard account? Enter your 16-digit card number on the front of your card. Enter the Expiry Date, in the dropdown windows, and then enter the 3-digit Security Code from the back of your card. Enter your Username in the “Username” box. Enter you Password in the “Password” box. You will need to create a profile with an associated email address and Security Question, in order to log in with a Username. Remember, a Myprepaidcenter Username cannot contain a card number and MUST contain atleast 1 letter. Your Myprepaidcenter password must contain minimum 7 characters and maximum 50 charecters, and MUST contain atlease 2 of the following: Uppercase letter, lowercase letter, and numbers. 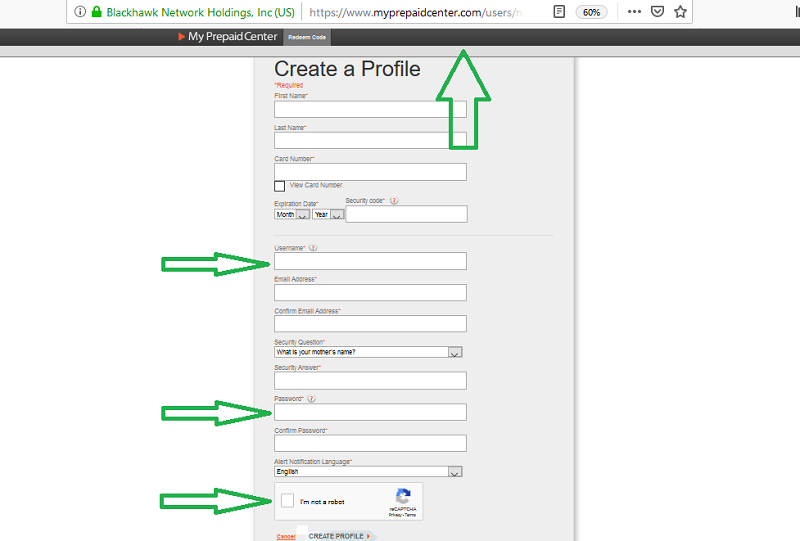 To create an accunt profile go to www.myprepaidcenter.com/users/new and fillout all fields. Remember to click “Im not a Robot”. Always know your available card balance. The card will decline, if it is processed for more than its total available value. Not all prepaid cards can be used everywhere. Your card will be accepted either anywhere, or at a select group of merchants, depending on the card. Write down the card number (on the front) and the toll-free customer service number listed on the back of the card. You will need this if the prepaid card is lost or stolen. How do I contact Myprepaidcenter Customer Service? If your Visa or Mastercard card is lost or stolen, the phone number is: 1-877-227-0956. MasterCard: 888-371-2109 (US and Canada) / 339-234-6415 (outside the US and Canada). Visa: 877-610-1075 (US and Canada) / 801-214-8892 (outside the US and Canada). American Express: 888-900-2347 (US only). Discover®: 888-842-0336 (US) / 801-744-9918 (outside the US). What should I do if my Myprepaidcenter Card is lost or stolen? Call the Myprepaidcenter Cardholder Services number on 1-877-227-0956 and give them the 16 digit card number. A new card will be sent to you, which will include the remaining value at the time your phone call. Replacement cards arrive within 7 to 10 business days via 1st Class mail. Any replacement card must be requested atleast 15 days prior to the “valid thru” date shown on your card. The 1st replacement card is free, and a fee applies for each replacement card thereafter. Myprepaidcenter Activation Required – How do I active my Myprepaidcenter Card? To activate you Prepaid Visa or Mastercard, you must log in first. Visit this page and enter your Card Number, Security Code and Expiration Date to activate your card and log in to your account. What if I encounter a problem my Myprepaidcenter Card at the point of sale? Always choose “Credit” instead of “Debit” if given the option. Ask the cashier/merchant to call the Cardholder Services on the phone number on the back of the card. For US and Canada Prepaid Visa Card holders, that phone number is 1-877-610-1075. Where can I learn more about Myprepaidcenter Prepaid Visa and Mastercards? If you log in to the Myprepaidcenter.com website, you can find detailed information on the help page. You can also contact the Cardholder Services at the toll-free phone number, which iis listed on the back of the card. Where can I see a list of my Myprepaidcenter transactions? Your most recent purchases and transactions is available on the “My Cards” page on www.Myprepaidcenter.com. You can also view transactions for the last 30-days. Is the Myprepaidcenter.com website Secure? Yes, it is secure. Information is protected by Secure Socket Layer (SSL) technology. This technology encrypts any information that you submit online. Where Can I use my Myprepaidcenter.com Prepaid Visa debit card? You can spend the Prepaid Visa debit card everywhere where Visa debit cards are accepted, except at gas pumps and ATMs. The card will also give you 5% cashback, when you use it at a select group or merchants, including: Gap, Bed, Bath and Beyond, Panera Bread, Red Lobster, Red Robin and many more. Check on Myprepaidcenter.com to find out which Visa cards will give you 5% cashback, and at which merchants..
What is the current balance on my Myprepaidcenter card? You must log in to see your current balance. Should I Select credit or debit? ALways select credit, and not debit, and then sign the receipt (even if the card says “debit” on the front). Do I need a PIN for my Myprepaidcenter Visa card? No, not if you choose “Credit”. No PIN is required, but you can create and use a PIN. Simply log in and click “Set PIN” near the top of the page. If you choose to create a PIN, then you shoukd use the card as debit. How do I use the Myprepaidcenter Visa card as part of multiple forms of payment? Does the Myprepaidcenter Prepaid Visa card expire? Yes, the card expires after valid thru date found a the front of the card. It expires after midnight EST on the last day of that month. You can request to receive the remaining funds after the card expiry date by calling the Customer Service phone number. A fee may apply. Does the Myprepaidcenter Visa Prepaid card have cash access? No. The card cannot be used at any ATM. Can I use my Myprepaidcenter Prepaid Visa for shopping online? If your name is not on the front of the card, you have to register it first at MyPrepaidCenter.com before you can use the card for online purchases. This is necessary as the online merchant will use the information to check your billing address. Online, the card balance must be large enough to cover the total purchase amount. If you cannot comple your order, then contact the online merchant customer service. Where is the 3-digit security code on My Myprepaidcenter Visa card, used for online purchases? You can find the 3-digit security code at the back of your card. They are the last 3 digits in the field where your signature go. Should I record the 16 digit Card Number on my Prepaid Visa/Mastercard/Discover Card? Yes, always store/write down the card number as well as the Customer Service phone number on the back of the card, for if the card is lost or stolen. Can I use the Myprepaidcenter debit card for recurring payments? No, recurring charges, like magazine subscriptions or monthly Gym memberships are not supported. How do I Avoid the Myprepaidcenter Card being declined? Card is swiped for more than the current card balance. Card is used at a gas pump or ATM. Card has not been activated before use. Card is swiped and you choose “debit” without first creating a PIN. Can I use my Myprepaidcenter Prepaid Visa card at restaurants? Yes, but be aware that for the card to be accepted, the available balance must often be up to 20% above the purchase amount. This is to cover the gratuity/other expenses at restaurants, salons, spas, bars, hotels, transportation services, car rentals and cruise lines. A transaction will be approved if the Myprepaidcenter card balance can cover the amount, plus up to 20%. What if my card is declined at a restaurant? If the card is declined, then swipe the card for a smaller amount. Add tips/gratuity up to the current card balance, and sign the restaurant receipt. Them, pay the outstanding bill amount with a another payment, card or cash. If the card is swiped for $90, it will decline due to insufficient funds, because the authorization is sought for $108 (Restaurant bill amount + 20%). In this example you can swipe the card for $80, which leaves you with a $20 balance on the card. Then, then add 20$ gratuity up to the remaining balance on the card ($20), and sign the receipt. Pay the remaining $8 due on the original bill with another card or with cash. Can I use my Myprepaidcenter Visa card at a Gas Station? The card will always decline if you it at the gas pump. You will have use the card inside the station. Can I use the Myprepaidcenter Visa card at a Hotel? You should only use the card as your are checking out of the hotel, not for reservations or check-in. The card will often decline at check-out if you use it for reservations, as hotels seek authorization for 15% more than the reservation bill, and the Visa card balance must be greater than this amount or the card decline. Can I use the Myprepaidcenter Visa card for a car rental? You should only use the card at the completion of the rental, when paying your bill. Don’t use the card for reservationsor pick-up, as the card will decline, when you return the car and may be inactive for 30 days thereafter. Can I use the Myprepaidcenter card internationally? Some cointries is on a “Prohibited” list, and the card cannot be used in those countries. You can shop internationally, but there is a conversion fee of up to 2% of the purchase amount. The prepaid card balance must cover this conversion fee, or the card will decline. If a merchant asks for a PIN, ask the merchant to “slide” the card and then choose “credit”. Many international payment points does NOT allow this card to be used, like train ticket machines, toll roads, parking garages, self-serve gas pumps, subway stations, luggage lockers. How does the 5% Myprepaidcenter Visa Card cashback work? When you use the Visa card at select participating merchants in the U.S. (see the list, when loggin in to www.myprepaidcenter.com), you will receive 5% of the amount back on your Prepaid Visa card within 7 to 10 days. But, the 5% back only applies to “Signature” purchases made with the card, and NOT at “PIN” purchases. Purchases made at locations outside of the U.S., and for purchases of gift cards made with this card, are NOT eligible for the 5% bonus cashbank. Can I sign up for email/text alerts for my Prepaid Visa Card/Mastercard? You will receive alerts, everytime your card is being used, if you opt in for this option when logging in. .
Is the Myprepaidcenter Visa,DIscover or Mastercard a Credit Card? No it in not a credit card, but a prepaid card. It does not affect credit ratings. Are there any fees with the Myprepaidcenter Card? Yes, log in to see the fees as they are specific to your card. I Checked my Myprepaidcard card balance, but it looks incorrect. What do I do? Log in, view the Transaction History, then contact Customer Service, if you think there has been fraud. Can I make Returns, credits, or “Void” a transaction with my Myprepaidcenter Visa Card? Credit will be applied within 7-10 business days, after you make a return, exchange, or void a transaction. Any “Credits” are not applied to expired cards. Where can I see my transactions on Myprepaidcenter.com? Log in and click on “Transaction History”. Can I dispute an unauthorized transaction? You can log in and print a “dispute form” and follow the instructions on the form, if your name appear on the front of the card and if the transaction is less than 60 days old. Is my Myprepaidcenter Prepaid Visa card reloadable? The company that issued the card can add value to it, reloading, at any time until the card expires. Contact the Card administrator of the company, that give you the card, if the card has not been reloaded as expected. Is the Tmobile Valuecard a Myprepaidcenter.com Card? Yes, the “Tmobile Valuecard”, sent to you by the Tmobile Switching Cost Reimbursement Card team, is handled by the Myprepaidcenter.com website. You should access the card information on www.Myprepaidcardcenter.com, and not on www.t-mobilevaluecard com. Which companies issue Prepaid Visa and Mastercards through Myprepaidcenter.com? Healthyroads Prepaid Visa and Mastercards.. . Exclusively Yours Prepaid Visa and Mastercards – Eycardonline. Paw Points! – The South & Western Visa® Prepaid Card. Rexnord RexRewards Program Prepaid DIscover Card. Bridgestone Prepaid Visa debit card. GEHA HealthBalance Prepaid MasterCard ®. The MasterTech Rewards Visa ® Prepaid Card. Multi Merchant Prepaid Visa card. The Bridgestone Visa ® Prepaid Card. ThredUP Visa ® Prepaid Card. The Shell Vacation Club Visa ® Prepaid Card. Verizon Visa ® Prepaid Card. The VCA Prepaid Mastercard ® Prepaid Card. The MVP Health Care Visa ® Prepaid Card. John Deere Financial Visa ® Prepaid Card. The MAX Mastercard ® Prepaid Card. Share your expreiences with Myprepaidcenter, in the comment section. 5 How do I contact Myprepaidcenter Customer Service? 6 What should I do if my Myprepaidcenter Card is lost or stolen? 7 Myprepaidcenter Activation Required – How do I active my Myprepaidcenter Card? 8 What if I encounter a problem my Myprepaidcenter Card at the point of sale? 9 Where can I learn more about Myprepaidcenter Prepaid Visa and Mastercards? 10 Where can I see a list of my Myprepaidcenter transactions? 11 Is the Myprepaidcenter.com website Secure? 12 Where Can I use my Myprepaidcenter.com Prepaid Visa debit card? 13 What is the current balance on my Myprepaidcenter card? 14 Should I Select credit or debit? 15 Do I need a PIN for my Myprepaidcenter Visa card? 16 How do I use the Myprepaidcenter Visa card as part of multiple forms of payment? 17 Does the Myprepaidcenter Prepaid Visa card expire? 18 Does the Myprepaidcenter Visa Prepaid card have cash access? 19 Can I use my Myprepaidcenter Prepaid Visa for shopping online? 20 Where is the 3-digit security code on My Myprepaidcenter Visa card, used for online purchases? 21 Should I record the 16 digit Card Number on my Prepaid Visa/Mastercard/Discover Card? 22 Can I use the Myprepaidcenter debit card for recurring payments? 23 How do I Avoid the Myprepaidcenter Card being declined? 24 Can I use my Myprepaidcenter Prepaid Visa card at restaurants? 25 Can I use my Myprepaidcenter Visa card at a Gas Station? 26 Can I use the Myprepaidcenter Visa card at a Hotel? 27 Can I use the Myprepaidcenter Visa card for a car rental? 28 Can I use the Myprepaidcenter card internationally? 29 How does the 5% Myprepaidcenter Visa Card cashback work? 30 Can I sign up for email/text alerts for my Prepaid Visa Card/Mastercard? 31 Is the Myprepaidcenter Visa,DIscover or Mastercard a Credit Card? 32 Are there any fees with the Myprepaidcenter Card? 33 I Checked my Myprepaidcard card balance, but it looks incorrect. What do I do? 34 Log in, view the Transaction History, then contact Customer Service, if you think there has been fraud. 35 Where can I see my transactions on Myprepaidcenter.com? 36 Can I dispute an unauthorized transaction? 37 Is my Myprepaidcenter Prepaid Visa card reloadable? 38 Is the Tmobile Valuecard a Myprepaidcenter.com Card? 39 Which companies issue Prepaid Visa and Mastercards through Myprepaidcenter.com?